Hotel Evropa, Popovo - снимки, цени на стаи, карта, описание на услуги и удобства, телефони за връзка. Targovishte province, Popovo municipality, Popovo, 89 Bulgaria Blvd. Hotel Evropa is a two-star family hotel in Popovo. It is situated on the main street of the town. Hotel Evropa offers modern day comfort and home-like cosiness at attractive rates. The close proximity of the two-star hotel to all administrative, financial and trade centers of the town, as well as its various amenities makes it a preferred setting for accommodation of visitors in Popovo, no matter whether they travel for business or pleasure. Hotel Evropa offers accommodation in 8 twin and double rooms. Three of them are spacious enough as to comfortably accommodated a third guest on an additional bed. All rooms are comfortably appointed and their welcoming atmosphere coupled with the modern facilities guarantee a pleasant stay for every guest. Hotel Evropa in Popovo offers breakfast, lunch and dinner upon prior notice at the bistro of the hotel. There is also a hall for gambling games as well as a possibility to rent a car from the hotel. Hotel Evropа has 2 twin and 6 double rooms. The facilities in every room include a TV set with satellite television, air conditioner, high-speed internet connection, en-suite bathroom with shower. If a twin or double room is rented as single, the room rate is 39 lv per night. The standard room rate per night is 40 lv inclusive of VAT. Popovo and its region offer splendid opportunities for outdoor recreations, sports and rest. Right next to the town is situated Kavatsite Dam, which is well known by keen fishermen. At the east part of Popovo is located a huge forest park, which is older than 100 years. This is the pride of the local people and their favorite place for recreation in clean air. At 20 km south of Popovo is created the eco trail Golyamata Reka. The place is famous for its splendid natural beauty, which demonstrates the transition from the Danube Valley to the hills of the Predbalkan. The locality is a lovely place for tasting ocal specialties prepared from ecologically clean produce, for taking part in local customs, for cycling, riding, fishing, walking and trekking. 6 km west of Popovo is located the newly discovered Kovachevsko Kale - a medieval fortress restored with eurofunds. 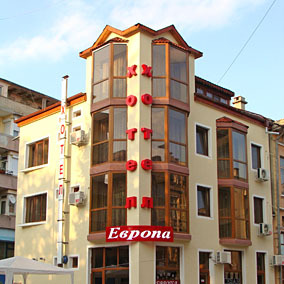 Hotel Evropa is located in the center of Popovo. The town itself is situated in near proximity to three first-class European roads, some 77 km from Ruse. Double and Twin Room 8 39.00 - 40.00 lv.